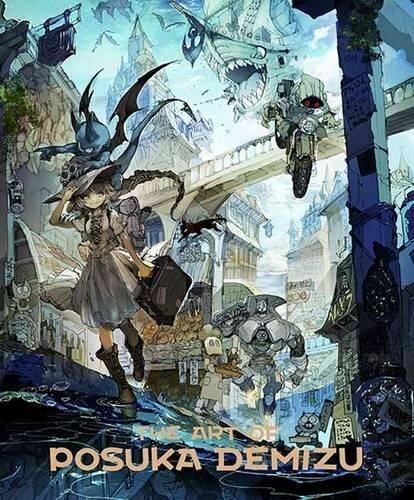 This is the first artbook that collects the artworks of Posuka Demizu, a manga artist known for her detailed backgrounds, cute characters and use of colours. This book is printed in Japan and published by PIE so the production quality is fantastic. Colours turn out well, binding is great. The highlight of the book would be the highly imaginative scenes, compositions, perspective and use of colours. The style may feel a bit sketchy but world and environment feels really grounded. There are some character designs as well which are terrific. Overall, the artworks feel really lively. Maybe it’s got to do with the sketchy lines, or the design, but the mood and atmosphere of the artworks are fantastic. This is an inspiring book for anyone who likes to draw or love Japanese manga style art. I recently purchased this book at the New York City Comic Con 2017. One for my daughter and one for myself. The printing and quality of the publication is beautiful. Any artist being a fan of anime and manga art should have this book in their library. I don't know what's up with these pronouns but Demizu is well known to be a woman.